Ex-Failbetter and Sunless Sea writer Alexis Kennedy has abandoned Earth for a moment to write a scenario for Paradox’s space grand strategy Stellaris. In it, an entity reaches out across space to call your civilization to it. Why, and how, form the story of the event which can spawn for all players since it was added to Steam yesterday evening. You can see the short teaser trailer above. Related: the greatest strategy games there ever were. In writing about it, Kennedy calls Horizon Signal a cross between The Twilight Zone and Event Horizon, a “full-on space-ghost-story” that he says seems to be what people wanted to see. He also says that it’s rather large, an “interactive novelette” of linked events, to make sure people notice it against the backdrop of the dozens of possible in-game events. For a deeper look at his process of creating it, do check out his blog posts on the subject. According to the press release for Horizon Signal’s launch, Kennedy is “scribing new stories for Stellaris” so it may not be the last. What he’s definitely working on is his current solo indie project, Cultist Simulator, about plotting to bring down society through arcane means. It sounds rather good, though is being developed alongside a lot of client work for Bioware, with whom he says he’s “booked out with [for] at least half [of] next year.” Wonder what that could be on. Horizon Signal arrives alongside patch 1.4, codenamed Kennedy, which has the usual heap of balance tweaks, bug fixes and small feature additions. 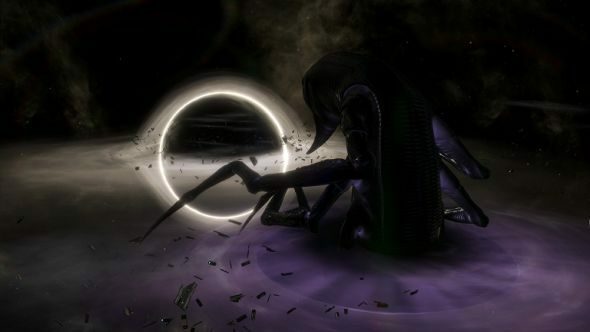 Jumping out of the official notes at me is a significant rework of the way the end-game extradimensional invasion works making it more threatening, and a batch of new achievements.